1 – Price – you can spend from $50 to nearly $3000 on a pair of binos. What sets them apart is primarily the quality of the optics. But that doesn’t necessarily mean that the only good pair of binoculars for birdwatching is the most expensive one. There are less expensive binoculars that deliver a good quality image, and much, but perhaps not all the rest of of experience. 2 – Field of view – For birdwatching you need to have a pair of binoculars that gives you a good field of view of the object so you can actually find the bird. The super compact binoculars I was so proud of as they were attractive and easy to put into a pocket while hiking, turned out to be impossible for me to find anything. I know I’m not alone in this complaint, although many people prefer the tiny ones and have little trouble seeing things. But mostly, if the diameter of the lenses are really small, it makes it more difficult to get the quickly moving bird in your view. It’s a personal choice, but I will always choose the pair with larger diameter lenses that will give a wider field of vision. 3 – Clarity, color and light – The optics have to be sharp enough that you can easily see a crisp view of the bird, and they need to be able to perform in low light. Not every bird is a shorebird on a mudflat in bright sunlight .And for those less co-operative forest birds active at first light, or owls at night, you are going to want enough light sensitivity that you can see the bird and some color in low light. This is something that some of the lower end binos may not deliver. 4 – Weight and comfort – If you are going to be carrying these around your neck all day, you need to be sure you can manage it. Binoculars are getting smaller and lighter in weight, so this should not pose much of an issue. If however, you find exactly the right pair for you but they seem a bit heavy to lug around all day, first make sure they are not too heavy to hand hold without shaking. If you can hold them steady, then you can purchase a harness which distributes the weight more evenly across your shoulders rather than around your neck. Also ask yourself how they feel in your hand? If they don’t feel comfortable when you are holding them in the store, you are not going to be happy holding them for hours in the field. And yes, some binoculars are more ergonomic than others, so hold several pairs that you are interested in before purchasing. 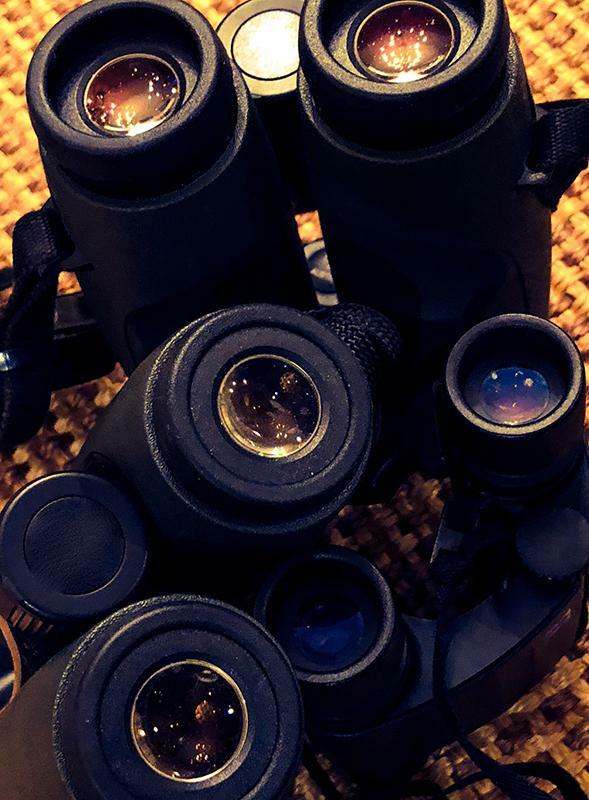 5 – Other – This category encompasses all the extraneous things like waterproofing, warranties, etc.. My comment about this is if the binos are not waterproof, don’t buy them. You will find yourself in inclement weather and receiving ocean spray more often than you imagine at the moment. Most binoculars now are both waterproof and fogproof, so you have no reason to buy a pair which isn’t at least waterproof. And it’s worth looking at the warranty, as if you are a dedicated birder you will find your binos will need servicing from time to time. And this may cost money if there isn’t a good warranty. The points above are the basics of things to consider, but which models should you look at seriously? This article from Audubon reviews binoculars in several price categories. Once you have decided how much you want to spend, take a look at the recommended choices and think about the above points. Visit a store in your area that sells binos and try out the ones that got the reviews you want and meet the requirements you need. Then take them for a spin before migration starts so you are ready to do some serious bird spotting. Here’s to some happy and successful birding this spring migration with your new binoculars!